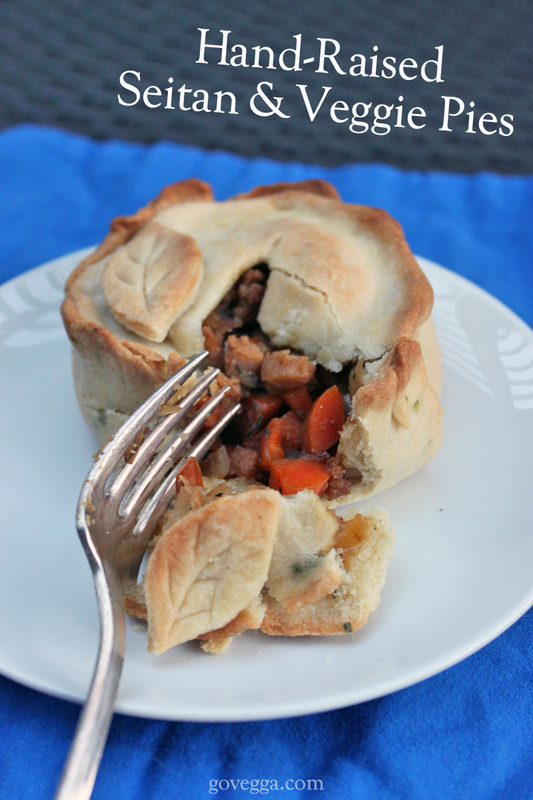 I recently tried my hand at vegan meat pies made with a hot water crust pastry. Lacking a pastry dolly (of course Paul Hollywood has a branded one for sale! ), I wrapped my pastry around a glass and it worked just fine. My filling is relatively simple, just homemade seitan and lots of veggies, but you could use vegan sausage or beef crumbles and complementary vegetables. Be sure to read through the recipe before beginning — hot water crust pastry can be temperamental, and you need your filling ready to go before you start the pastry. As it cools, it becomes difficult to work with. Follow the directions here. I added dried sage to my crust for a little extra flavor. First, prepare the filling. Heat olive oil in a saucepan on medium, then add onions and sauté for about 3 minutes. Add garlic, carrot, and leek and sauté for another 5 minutes or until all veggies are soft. Add the spices and seitan and cook for another 2 minutes, then stir in the Worcestershire sauce and ketchup. Turn off stove but leave on the burner. Next, preheat your oven to 425˚F and prepare your hot water crust pastry according to the instructions here. Working quickly, use a small drinking glass (about 3″ diameter) to mark the base of the pie (don’t cut out this smaller circle), and use a knife to cut a rough circle around it — add about 1″ extra, for a circle about 4″ in diameter. Wrap the pastry around the drinking glass to form the pie crusts. For the lids/tops, cut circles a little larger than the diameter of the pie crusts. (You can use another drinking glass if necessary.) Cut a small hole or slash in the tops. Place all raised crusts on a baking sheet. Add filling to the pie crusts, all the way to the top, then place the pie lids on top. Wet your fingers and gently crimp the crust to attach the lids. Optionally, brush with an aquafaba wash before baking. 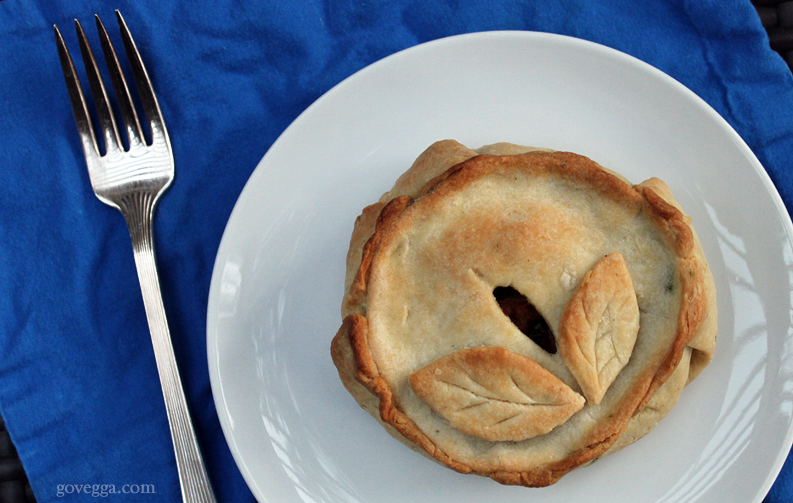 You can also use pastry leftovers to add decorative leaves, etc. Bake for 35 minutes or until pastry is golden-brown. Remove from oven and let sit for 5 minutes before eating. Brushing the pastry crust with aquafaba will give it a nice shine akin to an egg wash. Alas; I was out of aquafaba the day I made these! Feel free to experiment with the fillings — the crust is pretty good at holding it in, so something saucier would likely work just fine. Note: If you’re in the United States, I sincerely hope you’re voting today… and not supporting a candidate who represents the worst of humanity. How impressive! You should apply for the next series of Bake Off (if you can bear to be part of the programme without Mary, Mel, Sue and the BBC). The pies look so neat, and the filling sounds delicious!